That reminds me, it's New Years Eve. I wonder if I should be thinking of making a New Years resolution or something. I hadn't given it too much thought until just now!! While in the valley, my sister took us to her super secret discount store where she gets some amazing stuff. It was soooo fun. It's Bargain Harley's discount store in Berwick. Even my hubby had a fun time loading up on lots of items that were real bargains. We got golf balls, plastic Ziploc style snack bags, hair bands, Christmas wrap, a nightie, a golf club, a foil turkey roaster, knee pads, drill bits, clamps, a casserole dish, coffee candies, crayons, towels, birthday candles, barrettes and other things. I thought about it, but we didn't bring home a bike, jewelery, lamps, sheet a bissel spotbot, hammers, trailer hitch balls, camouflage wear, Christmas ornaments, giftware and decorations too numerous to even remember. Bargain Harley's might be something like Mardens in Maine. Although, I'm mostly only familiar with Marden's fabric section. I was looking forward to stopping into Avonport Discount that has name brand fabrics and tons of notions and books, but they were closed for the holidays. You know, I probably didn't need any fabric anyway! Have a great and Happy New Year Everyone! We had fun with Baby Aurora this Christmas. She was excited for all the presents and loved the new toys. She also loved dancing to the Christmas music with the tutu that Jessica had made earlier in the week. She and her mama went home on the weekend with all their Christmas loot. I rushed up to Fabricville on Sunday to get the boxing day fabric specials on curtain fabric that Carrie had pre-picked out. I spend the afternoon making curtains for Carrie and Kenny. 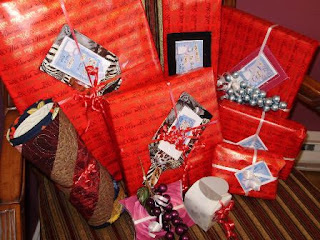 See their Christmas gift from us, was curtains for their living room, bedroom and bathrooms. 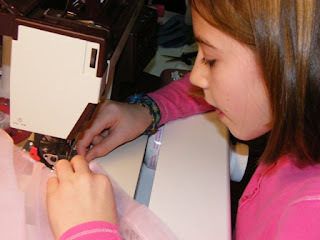 So on Monday, with all the curtains made, we hit the road and make a quick visit with Patience in Saint John, then went to Moncton where we did final hemming measurements and I finished sewing the curtains. The boys hung the rods and all the drapes were hung by the end of the evening. They all look really really nice. Today we drove to Nova Scotia and we'll visit with my sister for a couple of days. We had snow overnight but the driving wasn't bad. My sister had a really nice supper for us and then we played WII fit for the evening. So, the rest of the week will just be hanging out in the valley then heading home on Friday. On Saturday, we get our Christmas gift to ourselves delivered. Watch for post and a picture about what that is on Saturday. It's evening on Christmas Eve and everything is quiet. The kiddies are all on their way home now, to await the arrival of Santa. Jessica and Emily have new Christmas Socks to hang before they go to bed tonite. 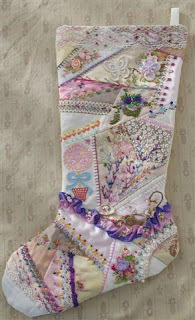 Do you suppose Santa will be impressed with these Crazy Quilted socks? I've been working on them since last winter and looking forward to them being used tonite. I wonder what Santa will leave in them. I need your help - the Blue Quilt needs a name! I was about to start making the quilt label for the St. Dunstan's blue quilt and I discovered that this quilt doesn't have a name. I'm sure it has a name, but I can't seem to find any name that goes with it. So I talked to Rose, who is my head quilter contact for the St. Dunstan's quilters and she asked me and my friends to come up with a lovely name, but it does not necessarily have to have the word blue in the name. Is that pressure or what? Will you help me by giving me some suggestions. Here are my 3 suggestions to help get you thinking. Many thanks for your brain power. We invited the triplets over for hot chocolate and a snack after skating. 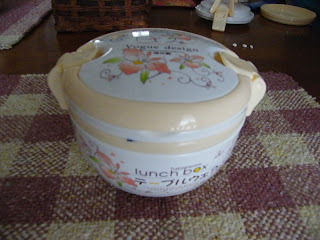 So Jessica and Emily worked really hard to make a nice snack for them in these cool bento-like boxes that I got from the Asian store. 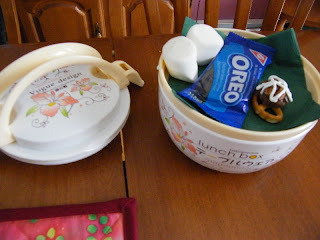 So in the top layer of the bento box was the Christmas napkin, a small package of Oreo cookies, a pretzel turtle which they made earlier in the day and a marshmallow for the hot chocolate. In this picture, do you see how the top of the box has handles that flip up for easy carrying. Just tooo cute. In the lower layer was nacho chips and a spoon. Nobody could figure out what the spoon was for. Of course it was to stir up the hot chocolate with. They all said "Oh Yeah". Jess and Em set the table and hand made place cards for each of the kids. They set out hot chocolate cups. We didn't tell the triplets about their special snack until they were in the house and half way up the stairs to the kitchen. They loved their special snack after a hard hour of skating. Then after the triplets went home, we all vegged around the living room for about an hour then it was time to get supper. 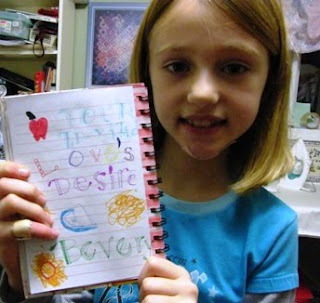 After supper, we went up to the sewing room, where Emily practiced her letters using my super fun doodling books. 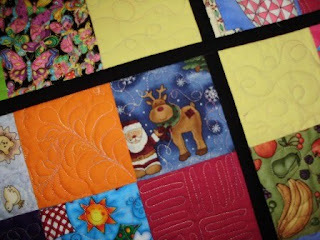 They are the same ones that I use to make quilting labels sometimes. Emily is so good at doodling that I let her use my secret set of colored zig markers. Jessica helped me make a tutu for Aurora. I found a fun pattern on the Martha Stewart website that had a video tutorial and I just had to make it. So since I had lots of help this week, the time was right. I expect that you'll see pictures of Aurora later this week dancing in her tutu. 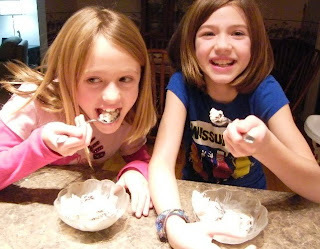 Then, as we were winding down for the night, a nice bowl of ice cream hit the spot. Scottsburn Udderdly Delight was the type of ice cream. Emily was very impressed with this flavor. Actually we all were. Tomorrow we all travel half way to Saint John to pick up baby Aurora. Jessica and Emily are going to teach Aurora how to play I Spy with her new quilt. 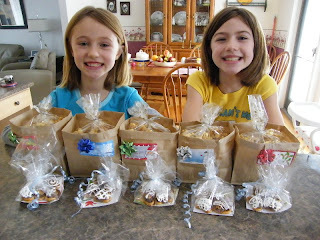 Then in the afternoon Jessica and Emily are off to make visits on the other side of the family and deliver their home made gifts . Then they will spend the night with the triplets. Then can you believe it, that brings us up to Christmas Eve!!! We'll have all 6 grandchildren here and their parents for a lovely Christmas Eve brunch. We had a lovely breakfast that Jessica prepared. 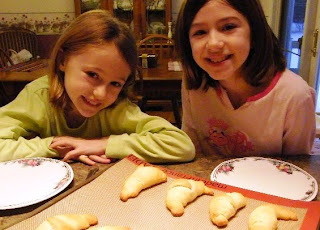 Pilsbury croissants are so easy to make. Emily sat with me while we checked emails. 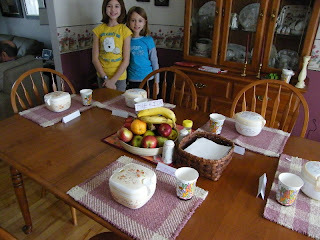 Then the timer dinged and Jessica and Grampie called us for breakfast. 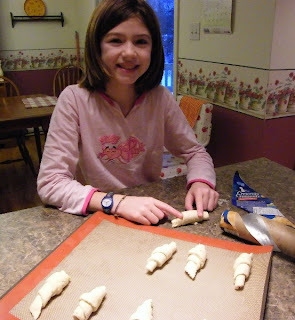 Mmmmm Croissants are so yummy. We really need to have these more often. Next we made turtles. This was a super fun recipe that was easy to do. 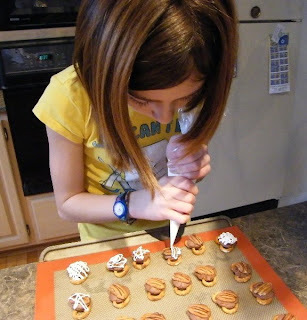 First you put the pretzels on the baking sheet. 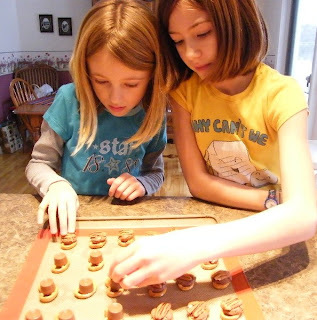 Then put the rolo candies on them. 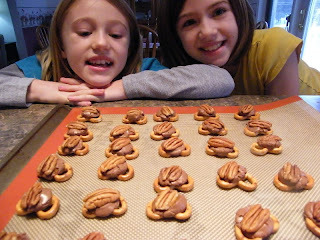 Bake them in the oven for a few minutes, then press a pecan half into them and let them cool. Icing them takes a skilled hand but Jess and Emmie each decorated 15 turtles very nicely. They did squiggles, stars, and criss cross lines. 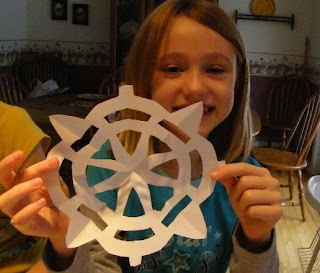 We tried making fancy paper snowflakes and stars. We did a few of these and they were tooooo hard to do. Maybe next year!!! 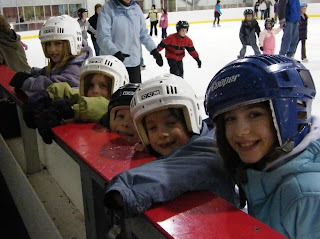 This afternoon Jess and Emily and the triplets all went to the Willie skating rink for an hour of fun. Special thanks to my friend Linda who loaned me skates for Jessica . The kids all had a good time and no major injuries. Well one little injury, but we won't talk about that, right Emily!!! 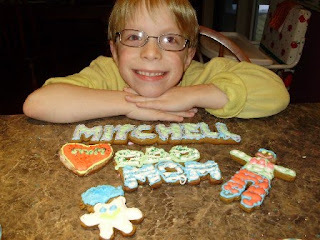 Watch for part 2 of this blog tomorrow for the after skate party that we hosted for the triplets. I don't know what it is, but my hands are rough and dry dry dry. I'm sure it's a combination of the cold weather, the wood stove being on constantly. That coupled with the constant hand-washing to avoid those H1N1 bugs, and then that coupled with doing so much sewing, my hands are so rough, they're picky against the fabric. I've been using just regular hand cream but the effect of that lasts about 5 minutes. I didn't think of it until last night, but I have a recipe that I got from the 1999 Spring CQA Newsletter, to make a quilters hand cream. I'm going out to Shoppers Drug Mart to get all the stuff and I think I'll make a batch. If you don't have a Shoppers, just buy your local drugstore brand. Here is the recipe. 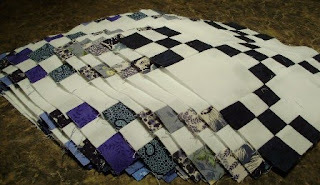 It's best to get a few of your quilter friends to go in on a batch with you and then everyone will have some. Whisk all together and put into decorative jars. This is going to be a power packed two days for all four of us, Grammie, Grampie, Jessica and Emily. It's not often that the kids can visit exclusively for two days in a row so we're cramming in as much as we can. Our day started out by Jess and Em making Grammies breakfast. 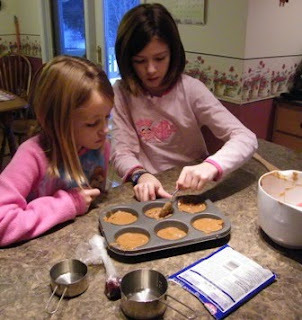 While I was having morning coffee, they made me bran muffins. They are old enough to read the instructions on the muffin package so it was pretty straight forward. The bran muffins were yummy. 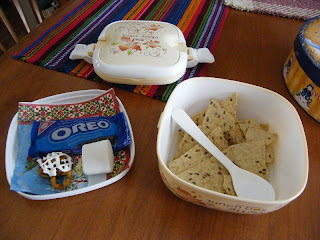 After breakfast, we decided to make our geocache. 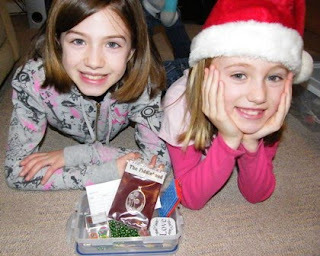 We searched the house for trinkets to put in the cache. We made a log for the cache finders to sign, and we sharpened a pencil as the final things to put in the cache. It's all ready to be camo'd a bit (that means camouflaged for you muggles) and ready to hide. It has a fabulous "First to find" gift in it, which is a pewter tree ornament on it. We'll go out to look for a great hiding place for the cache later this afternoon. Where were you at 12:47 on December 21st. That's the exact time that winter started. We were on our way to Mactaquac. 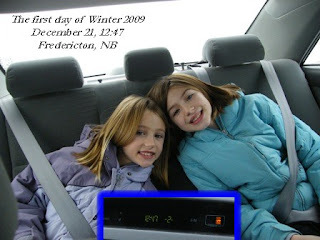 See the time, and how warm it is in the picture that was is inset in blue. It was all the way up to -2 degrees which is a great temperature for a winter day. Then when we got home, we are making old fashioned poppycock using this recipe. We packaged this up into gift bags and Emily put the tags on them. They look really nice and they will take them as gifts to their other grandmothers and great grand mother when they go for visits on Thursday. 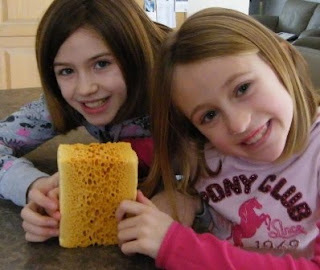 Here are the girls tast testing the poppycock. Jessica wants this recipe to take home... She loves it. She'll be making sure that she asks her grandmothers to try it, so she can have another taste test too. On the way back from Mactaquac, we stopped at Zellers and we found this sponge toffee. I used to eat this when I was a kid. I'm surprised they still have it for sale. So we bought one for Jess and Emily to try. Emily wasn't so sure she liked it, but Jessica thought it was soooooo awesome. It's time to hide the geocache. We found a great spot that has a parking lot nearby. And the trekking through the snow won't be too bad. 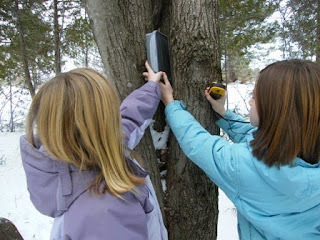 Our clues will be inspired by the surroundings of the trees. We'll register this brand new cache this evening on geocache.com. It'll be interesting to see how quick somebody finds it after it is registered. I predict that somebody will find it before Christmas for sure. We've had a busy day and we're settling down to a quiet of evening of watching Survivor. Stay tuned for tomorrow, when we'll be doing more projects. I just have to give you a glimpse of my tree this year. At our final Friday Girls coffee break of the year, we did a little Christmas ornament exchange. I randomly chose a small light package in a pretty organza fabric reusable giftbag. 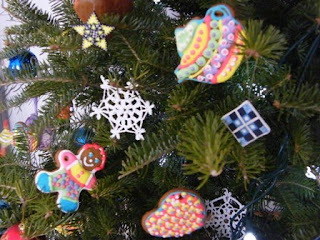 Inside were two beautiful quilty polymer clay tree ornaments. They came from Lee who bought them at the annual Christmas in the Village event which is held in nearby Gagetown. Can you spot them? They are the yellow star and the blue 4-patch block. I love them. Thanks Lee. For a few years now, I make and decorate gingerbread with the kids and somehow I always forget to keep a few for my tree. 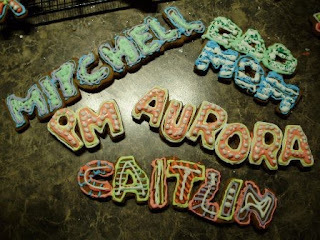 So earlier this week, I made and decorated a dozen cookies for my tree. They give a nice gingerbread smell to the tree. What a treat today. We went to see Caitlin's very first Syncro Water show. She's the one in the red bathing suit on the very left end. Great job Caitlin. It was a great show and all the swimmers did an awsome job. There's so much going on that yes, I had to do 2 blogs today. Earlier this week, after getting advice on how to handle this gift of silk fabric, I decided that I would not use it in a quilt. I will make decadent scarves to go under a winter coat with it. On this first scarf, I pressed under the seams twice and did a machine hem all around. This fabric was indeed delicate but it's so nice to wear and I feel like a movie star wearing it. I might go buy a coat to match the scarf. I'll be gifting this actual finished scarf back to the girl who gave me the fabric soon. She will be surprized. I'll be making myself another after Christmas. 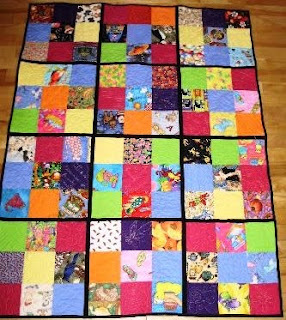 Another finish today is an I Spy quilt for Aurora. It really wasn't intended to be a Christmas gift, but it's so close to Christmas, I might just wrap it up. I don't know what I was thinking when I made it. I intended for it to be a small quilt but my math was all wrong. Because I used 4.5" I spy blocks with alternate plain color blocks, it is 36 x 48". I didn't intend it to be a bed size quilt, so my plan "B" is to just leave the borders off. This quilt was done using this quilt as you go method and I used a slightly wider strip (2") on the back seams so that I could finish the seams on the back by machine rather than by hand. I only started putting blocks together on Wednesday evening, so it went together super fast. Won't Aurora have fun on Christmas day when I say to her... "I spy with my little eye, where is Santa?" 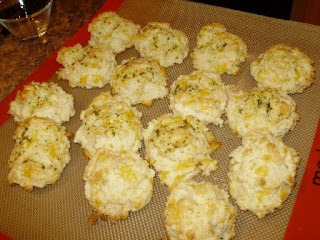 Have you ever had the cheddar biscuits at the Red Lobster restaurant. We don't have a Red Lobster in our area and it's almost a year since we've eaten at one. The one thing I look forward to is there, is their biscuits that they bring you when you order an entree. They're so buttery, salty, cheesy and tasty and light. Last week we hosted a dinner party for friends and seafood was on our menu. I thought about those Red Lobster biscuits and nice it would be to have those to compliment the seafood casserole that I made. I did a quick search on the Internet and guess what? I learned that the Red Lobster biscuits are the most googled for restaurant recipe. I found many link for their recipe, but I used this recipe. I and was so surprised that they are made out of Bisquick. 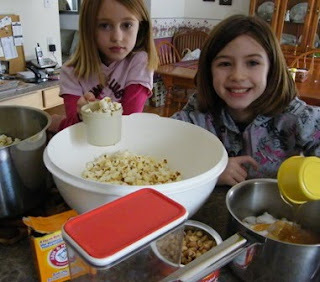 This recipe comes from the book Top Secret Restaurant Recipes 2 and they shared the recipe with ABC news. Really, if you like the Red Lobster biscuits, you must try these. They were really remarkable and light. I got many compliments on them at the dinner party. 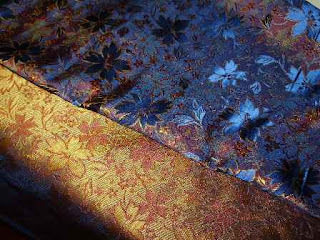 Does anyone know how to use or sew with pure silk fabric? A friend gave me the most beautiful piece of pure silk fabric. She's had it for many many years. She told me who gave it to her, but she told me as she was handing me the fabric, and I was so overwhelmed with the beauty of this fabric that I didn't hear a word she said. Then in the next instant I realized she GAVE me the fabric because she said she'll never do anything with it. 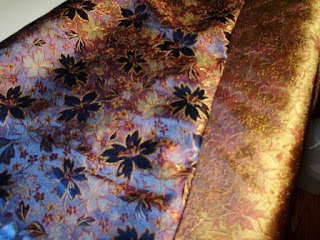 The fabric is blue and gold and has a holographic look to it. One way you look at it, it's all a beautiful deep blue. You look at it another way, and just the flowers are blue and the rest is gold. The black of the fabric is a solid gold color. There must be 4 yards of this fabric and it's about 24" wide. 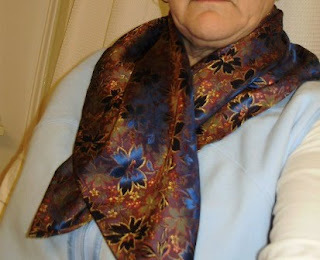 I decided I would take a 24" square of fabric and try to fashion a beautiful scarf to go under a winter coat. The fabric is very delicate. I lightly ironed up a small double hem on each side and have it pinned. My question is, should I use a sewing machine to sew the four hems, or should I do it by hand. Should I use silk thread, or another kind of thread? Has anyone had experience with silk? 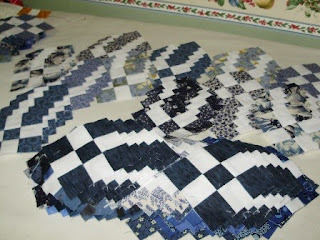 This week 3 of my 4 weeks of making the blue scrappy quilt for St. Dunstan's. I bet you have wondered how I get so much done from time to time. Well, here is my secret. I sometimes have a quilt helper. 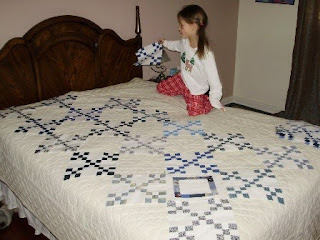 Caitlin was here this afternoon and she took on the single job of laying out my quilt. While she was laying out the quilt, I was finishing the last of the square in a square blocks and I was giving them to her one by one at the end. 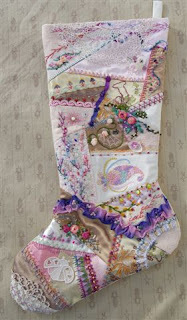 I have all the blocks done and next is to sew the diagnol rows together. I turned the quilt on my bed upside down and this is what she's laying out the quilt blocks on. Here she is, with almost all the double nine patches strategically placed. Then come the blocks with the square in a square. Then the last to get placed on are the side triangles . She arranged and re-arranged so that there wasn't too many dark blocks beside one another or too many lights. She primped and primped for quite a while. She did a lovely job don't you think. I've come to the realization that I won't get this done before Christmas but I'm very pleased with my progress so far. I ran into a snag and I need to get a quilt expert opinion before I can move on. Just the same, all the blocks will be packed up and will come out again after the New Year. 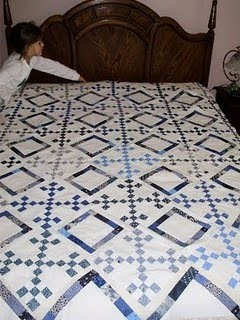 So watch for the finishing of the Blue Quilt which should be around January 10th. It's getting fun now. We're shopping, cooking, making lists and preparing for next week. The garage smells like Christmas because our freshly cut tree is in there relaxing in a pail of water. Within a day or two, it will be dressed for the season. The wrapping and mailing of Christmas presents to my sisters household is done and on the way. On Sunday, we are going to a Christmas Concert at St. Dunstan's church and we'll have Jessie and Emmie with us. Then we're all going to see Caitlin's syncro swimming exhibition. If that doesn't put us right in the Christmas spirit, I don't know what will. Jess and Em are staying for a few days and I have a very busy agenda planned for them for Monday and Tuesday. I hope they're resting up. Watch for daily blogs about our activities. Then Baby Aurora is coming on Wednesday. It'll be fun this year with her because she already knows it's a fun time of year. Just wait until she realizes that Santa will be bringing her presents on Christmas Morning. Baby Aurora is here for a visit this weekend. She's almost two and she talks a blue streak. She repeats everything you say. She loves the Sesame Street characters and she has an obsession with my pencil crayons that I keep in the family room. Up until now, she just takes them out one by one, and then puts them back in the box. Over and over and over. But this weekend, was special. 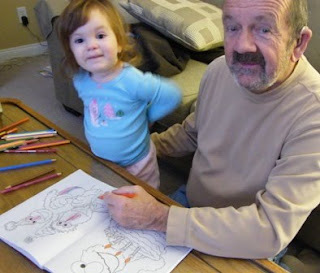 We started to color in a Sesame Street coloring book with her and she loves it. She'd stay there all day to color and talk. Also, she's doing really well with her potty training. She's even trying to potty train her bear just like her mama is training her. 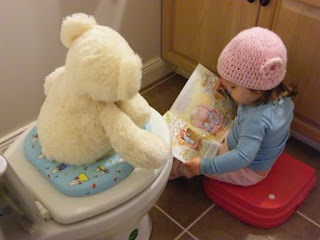 She's reading a story to her bear so he won't get off the potty. She loves to wear her outdoor hat indoors. Even when it's too cold to go outside. She's just a delight to have around. 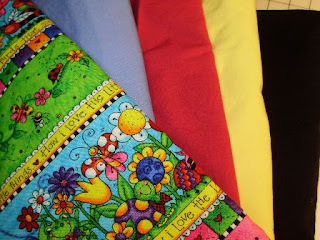 I've been collecting I SPY fabrics for about a year now to make Aurora a quilt. This past week, I took some time to decide on a block size and cut out some 50 blocks. Since she is talking up a storm now and loves to repeat words, she is ready for an I Spy quilt. I'm hoping to have it in time for Christmas. 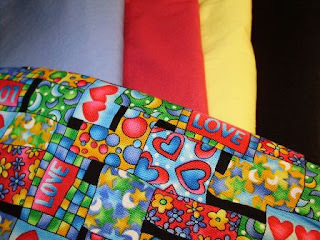 As you might imagine, the I SPY blocks are from various fabrics and are every color under the rainbow. 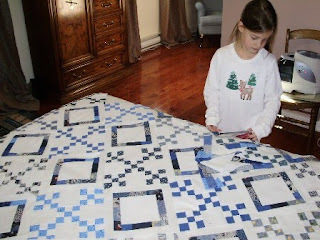 Since I only have 50 I spy blocks, I'll be setting alternate plain fabric blocks which are shown here and then the quilt will have a good size border that is made out of a fun kid print. I can't make up my mind which border print I should use. I have 2 selected. The first one is a fun flowers and bugs fabric. The second option is more of a mod fabric, but still really cute. Do you have an opinion as to what I should use for a 2 year old? Last week I had set a goal of having my 30 double nine patches done on St. D's quilt. Here is what the 150 9-patches looked like before they were sewn into more 9 patch blocks. They look big but they are only 3.5" big. And here's what they look like when they're all sewn into the double nine patch and ironed. I'm on to the next step now which is sewing the 20 inner blocks and the 18 side triangle blocks. I hope to be starting to sew them in the diagonal rows by next Thursday. It's looking good for getting this done before Christmas. A week of Christmas Cooking. I'm in the holiday cooking spirit. This is going to be a week of cooking. Last evening, I happened to be going through a couple of December magazines that have been on my coffee table for a week or so. Just looking at all the festive recipes has got me in a cooking mood. This morning I tried these Coffee Sugar nuts out of the Canadian Living magazine. I like anything that is coffee flavored. These are sweet and addictive. Next time I would add a bit more coffee. The recipe calls for instant espresso, and since I didn't have any, I used instant coffee. They are still yummy. 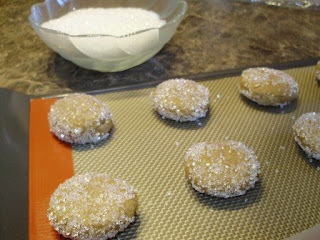 I also made these ginger sugar cookies from the Better Homes and Garden website. 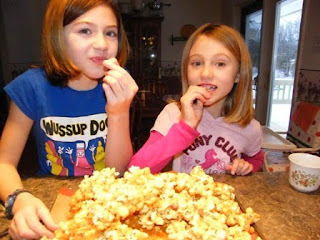 I loved the picture in the magazine and I did happen to have some big sugar on hand. 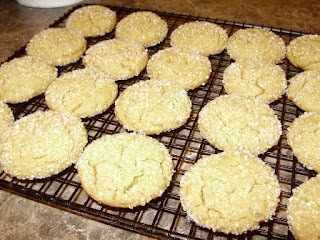 The recipe is called Giant Ginger cookies, but I used my standard 1/8 cup scoop and made regular size cookies. I made half the recipe and it made 45 cookies. That's lots for us to both freeze and keep in the cookie jar this week. 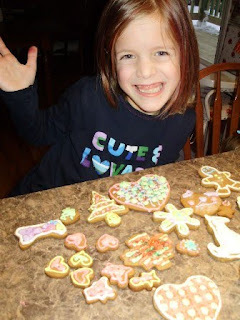 On Wednesday afternoon, the triplets will come over for our annual gingerbread cookie decorating. I'll be making and chilling the cookie dough Wednesday morning. I bought really nice Wilton snowflake cookie cutters to add to my collection. 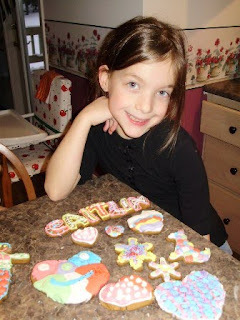 So in the afternoon, the kids will roll out the dough, cut out their cookies, then decorate them. Watch for those pictures. I promise they will be fun. Thursday, we are having friends over for a supper party. Hubby and I have the menu made and we are looking forward to have a fun evening with friends. 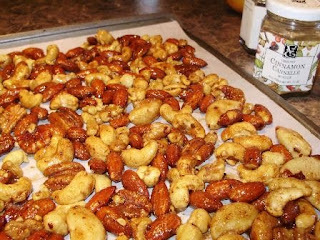 EDIT: Here is the recipe for the Canadian Living Coffee Nuts from the January 2010 issue. In a bowl, using a for, beat egg white with water. Add nuts stirring to coat. Bake in 275 degrees oven until nuts are toasted, about 1 hour. Break up clumps. Let cool completely on pan.